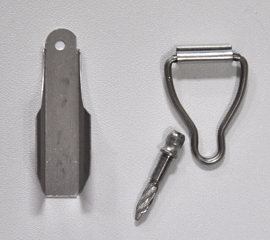 This hardware kit is made for wood windows and ensures a secure fit for you screen. Two styles are available: Spline On or Slip On. The bail loops is attached to the screen. The screw is typically screwed into the bottom window sill and the bail loops fit over the screw head. The jiffy hangers mount on the sides of the window at the top and create a hinge for the screens to slip into.